​Incorporated in 2010, the Central Ventura County Fire Safe Council is a 501©3 non-profit mutual benefit organization with a mission to reduce the threat of wildfire to farms, ranches, urban neighborhoods and infrastructures through an aggressive program of action, education and collaboration. The primary goal of the Chip Away for Fire Safety Project is to help facilitate and increase weed abatement activities in and around the City of Santa Paula and other locations throughout the Santa Clara River valley by offering a clean, no-cost alternative for disposal of excess tree trimmings and vegetation. This project is funded by a grant from the US Forest Service. After the devastation caused by the Thomas Fire in December, many people are concerned about the safety of their property should another fire break out. Although local fire departments have strict rules about vegetation management and can aid in education and enforcement, everybody is a stakeholder in the community. “The Central Ventura County Fire Safe Council is delighted to be able to offer this free service to residents of Santa Paula, especially at this time when we are all so aware of the fact that we must all play our part in reducing the chance of having another disaster like we just experienced with the Thomas Fire.,” said Mike Burns, Board President. Homeowners and residents are encouraged to sign up for the free chipper service ahead of time by going to www.cvcfiresafe.org and completing a simple online registration form. Priority will be given to those who sign up ahead of time but the project team hopes to be able to provide the service to all comers. On the day of the event, homeowners will be asked to have their pile set out alongside the road or in the driveway by 8:30am. A chipper and crew will go to each address and chip the vegetation. The resulting biomass can either be left in a pile or removed for disposal. If this is a drop off event, please bring your trimmings to the designated location between 8am and 2pm for chipping. 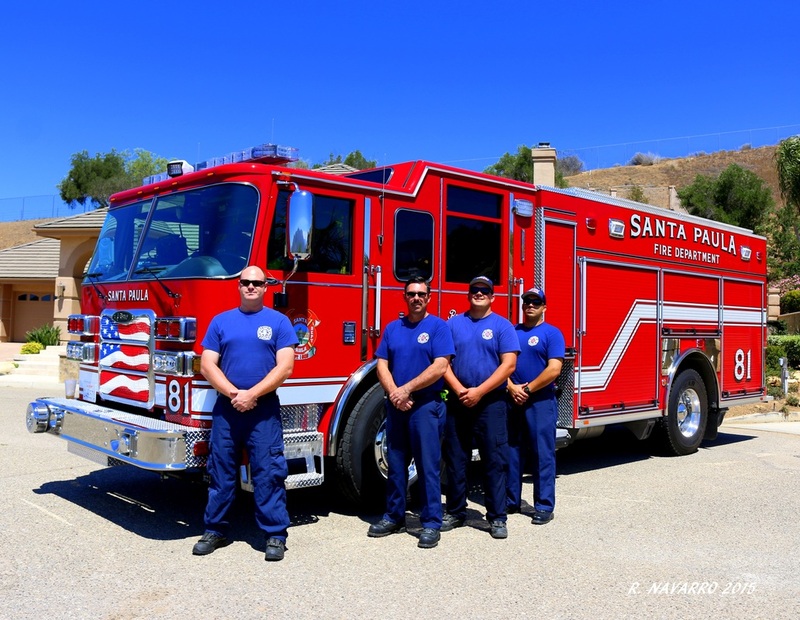 New Pierce Fire Engine Goes "In-Service"
In July, the new Engine 81 hit the streets of Santa Paula. Engine 81 is a 2014 Pierce Arrow XT built by Pierce Fire Apparatus. It features a 500 gallon water tank, Piece PUC water pump, and various cutting-edge technologies. Engine 81 will serve the community from Fire Station 81, located at 114 S. Tenth Street.